Preheat the oven to 350 (F) -- this is a 50 (F) -degree increase from the original recipe temperature of 325 (F). Put the flour, cocoa powder, sugar, baking powder, salt, and butter in a freestanding electric mixer with a paddle attachment (or use a handheld whisk) and beat on slow speed until you get a sandy consistency and everything is combined. Whisk the milk, egg, and vanilla together in a pitcher, then slowly pour about half into the flour mixture. Beat to combine and turn the mixer up to high speed to get rid of any lumps. Turn the mixer down to a slower speed and slowly pour in the remaining milk mixture, making sure to scrape any unmixed ingredients from the side of the bowl with a rubber spatula. Continue mixing for a couple more minutes until the batter is smooth, but do not overmix. Spoon the batter into paper cases until two-thirds full and bake in the preheated oven for 22-26 minutes, or until the cake tops bounce back when touched. A skewer inserted in the center should come out clean when the cupcakes are cooked. Let the cupcakes cool slightly in the muffin pan before turning out into a wire rack to cool completely. 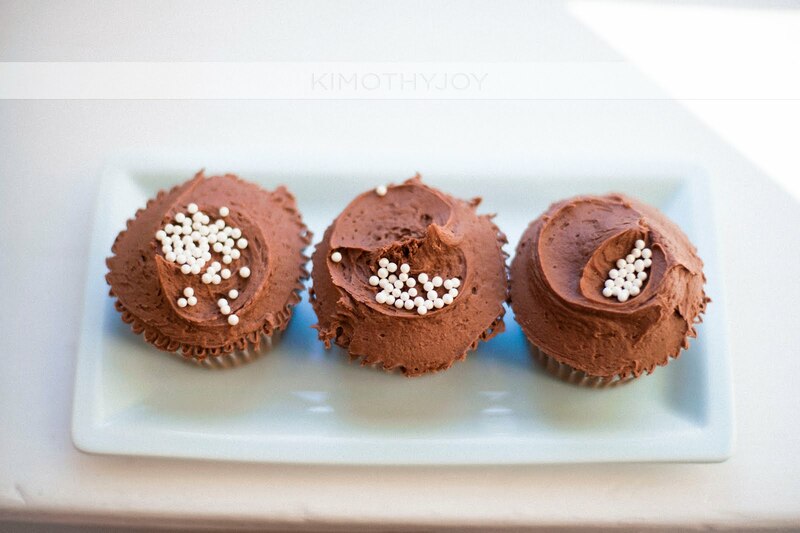 When the cupcakes are cold, spoon the chocolate frosting on top and decorate accordingly. Beat the confectioners' sugar, butter, and cocoa together in a freestanding electric mixer with a paddle attachment on medium-slow speed until the mixture is well mixed. Turn the mixer down to a slower speed and add the milk to the butter mixture a couple of teaspoons at a time. Once all the milk has been incorporated, turn the mixer up to high speed. Continue beating until the frosting is light and fluffy; this should take at least 5 minutes. Do not substitute the unsweetened cocoa powder for sweetened cocoa powder; doing so will make the chocolate flavor less intense. When creaming butter and sugar together, always make sure you keep creaming until the mixture is light and fluffy (this will usually take around 5 minutes). This helps the cupcake rise nicely in the oven. After adding flour to the mixture, do not overbeat the batter as this will overwork the flour and make the cake dense. Simply beat or stir until the flour is just incorporated. In my opinion, making sure you don't overbeat the batter is one of the hardest parts about baking. Specifically for the the chocolate buttercream frosting: the longer the frosting is beaten, the fluffier and lighter it becomes. Add your extra decorations (e.g. sprinkes, nonpareils) immediately after frosting the cupcake; if you wait to decorate the cupcake, the frosting will harden and the decorations will not stay on the cake. This looks absolutely delicious. Would love for you to share your gorgeous pictures with us at foodepix.com. I will try your choco cupcake recipe. Looks really cute and chocolatey...with colorful sprinkles on top, well, the little girl want to do the honors of sprinkling. Thanks! Hi MyFudo -- thank you! Just be sure to use the sea-level quantities for ingredients if you're not in high-altitude like I am. If you're at sea-level, I would decrease the oven temperature to 325 (F) and use 1.5 teaspoons of baking powder. i made these cupcakes for my family and they loved them! but my mom wants a cake that tastes like the cupcakes. can i just put the cupcake batter into a cake pan, or do i have to find a different recipe? Hey, I've never done this before, but I think if you double the recipe and bake it in a 9x13" square pan it might work. Similarly, you can also use two 8inch round cake pans. Let me know if that works! Yummy cupcakes. Very light tasting.